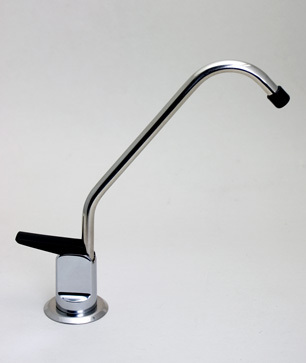 High quality ledge faucets for undersink filters & reverse osmosis systems. What size countertop hole do I need? Do I need a air gap faucet? 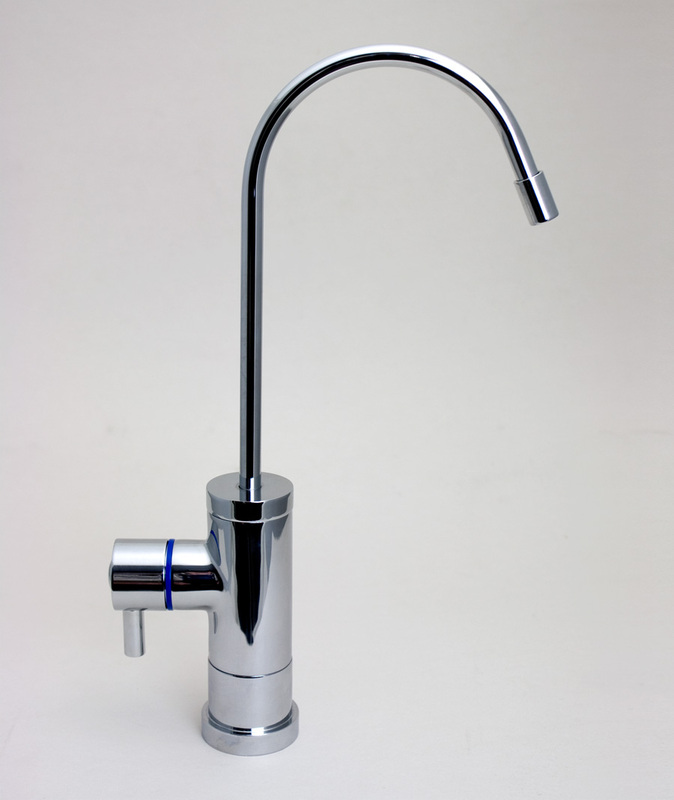 A faucet is the most visible and accessible part of any drinking water system. It's the part that you have intimate, daily contact with. If you don't like the faucet, you probably won't like the drinking water system. Choose a faucet you like. It's an important part of the equipment. The ledge faucets on this page are the finest available. All are from Tomlinson, for many years the United States' most respected maker of spigots and valves for water dispensing equipment. 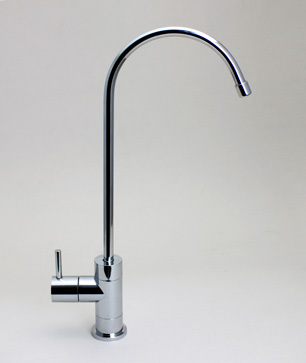 Tomlinson faucets are of exceptionally fine quality. All have smooth and easy handle action and spouts that swivel 360 degrees. All have pre-installed 1/4" tubing. They are standard-sized. You can easily replace your current faucet with a new one, regardless of the brand of your filter or reverse osmosis unit. All are offered with non air gap and air gap option. If you search the internet you can find less expensive faucets. As for us, we made a decision that the day of the cheap faucet is over. There seems to be a race to the bottom in the water treatment industry with everyone competing to see who can offer the cheapest faucet. We've dropped out of the race. A cheap faucet is as difficult to install as a really good one. In fact, it's often more difficult. The saving in the low purchase price is more than erased by the short life expectancy. Purchasing a cheap faucet and replacing it yearly is false economy, and a lot of unnecessary trouble. Not to mention that you are depriving yourself of the enjoyment of daily use of a really beautiful and well made product. 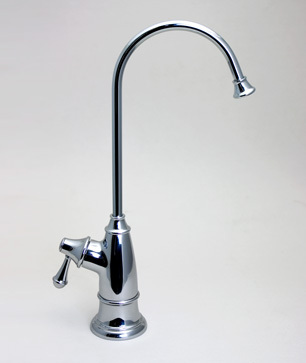 We're proud to offer the Tomlinson faucets on this page. We believe that you'll agree that the small difference in price is more than repaid by the quality and beauty of the product and the extended service you'll receive. All of our faucets are NSF ANSI 61 certified and meet all U.S/California lead free standards. See additional information for hole size requirements and air gap explanation. Our new reverse osmosis units and undersink filters come with the Pro-Flo as the standard faucet, although the Value faucet below can be substituted. 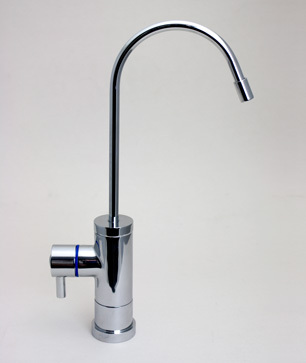 The tough but attractive Tomlinson Pro-Flo faucet is the standard faucet for all our undersink filters and reverse osmosis units. It's a sturdy top performer that uses the proven, traditional up/down handle style. Tomlinson's beautiful “Value” Contemporary ledge faucet is a zinc alloy light-bodied version of the top-of-the-line Contemporary style (see below). It has an easy operating 1/4 turn handle. The spout swivels 360 degrees. Easy to install with preinstalled 1/4" tubing, it is available in standard non air gap or air gap style. This is one of the optional faucets that come as standard equipment on our new undersink filters and reverse osmosis units. We offer all of the available colors & finishes for both the “designer” and “contemporary” style Tomlinson faucets on a special-order basis. Please call or email if you have questions about availibility and shipping times. Holes! What size countertop hole do I need?